Home/Veterinary Models/Canine Anatomical Models/Canine Anatomical Skeleton Large (Bosley Dog) Mounted 49:" x 23"
Deluxe skeleton of a large dog. Removable skull with spring mounted jaw. Mounted on base. Cast plastic composite material. A great educational and illustrative model. Ideal for veterinary clinical display and pet owner/consumer education. 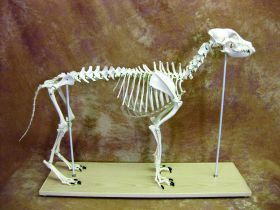 Please check out our PROFESSIONAL GRADE "Real Bone" Canine, Feline, Equine and Bovine Skeletons, (Mounted or "Disarticulated" Bone Sets) also listed. Recommended for scientific research and education. SPECIAL OFFER: LFA #9201 A wonderful set of five (5) of our most popular Veterinary Anatomical Models including LFA #9050 Canine Knee, LFA #9060 Canine Pelvis/Hip, LFA #9150 Canine Heart with Heartworm, LFA #9195 Canine Jaw, and LFA #9200 Canine Ear. Please request a quotation on an alternative "menu selection" including the Feline models available. Email or call for latest quotation. 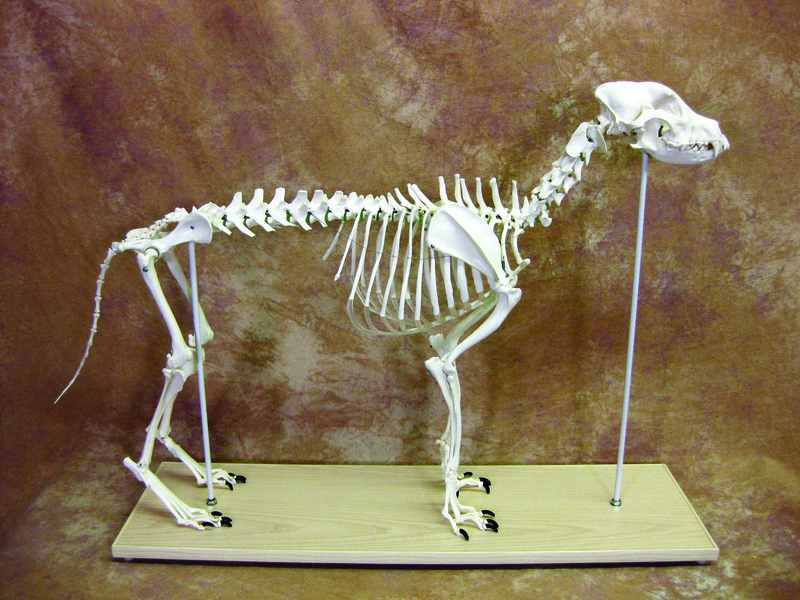 Model sets are ideal for the new Vet, DVM practitioner or Vet Tech student, etc. A complete set of 18 detailed Veterinary Anatomical Model Educational Key Cards to accompany the LFA Veterinary models listed. Heavy duty. Durable. Includes the NEW LFA # 9095 Canine Parasites Key card (See photo image). 18 different cards per set. Includes Canine and Feline models. Card Size: 6 1/2" x 5 1/4".